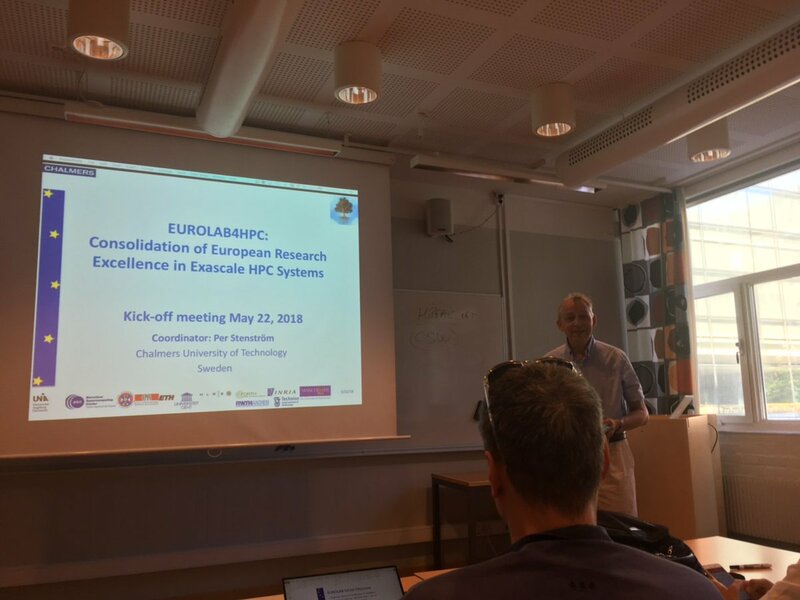 Eurolab4HPC kicked off in Gothenburg! On May 22nd, 2018, we officially kicked-off the second Eurolab4HPC project at Chalmers University, Gothenburg and home of coordinator Per Stenström. Motivated by the fragmentation in the HPC systems research communities, the first Eurolab4HPC project managed to join forces among the major European research leaders in HPC. Moreover, in this first project, Eurolab4HPC delivered a long-term research vision on HPC technology (2023-2030), a validated HPC curriculum and best practices for on-line learning and a process for accelerating innovations. But it also managed to join other major HPC stakeholder organizations (ETP4HPC, PRACE, HiPEAC, HPC CoEs). Per Stenström: "The second two-year project, we switch gears with the bold objective to have Eurolab4HPC build a connected and sustainable leadership in HPC systems." Building a broad community of HPC systems research by welcoming new members to our virtual network. Offering HPC systems courses through Eurolab4HPC School. Investing in open source projects for HPC. Investing in innovations by encouraging community members to take advantage of services in the Eurolab4HPC innovation Pipeline including training and mentoring for startups and technology transfer projects and exposure to venture capitalists through special events. Disseminating the Eurolab4HPC Vision and collect feedback for a next version of it. "Clearly, Eurolab4HPC has a bold ambition and responsibility in Europe's quest for being a leader in HPC systems."